If you’re athletic, adventurous and ready for everything that life throws at you then you’ll love the all-new 2018 Honda Civic Si. This Civic model is built for performance, and its styling makes it stand out from the pack. The moment you sit in the Civic Si you’re ready to fly down the open road. You know this sporty car can take you anywhere. The Honda Civic is a vehicle you recognize on the road, but not just for its design and engineering. 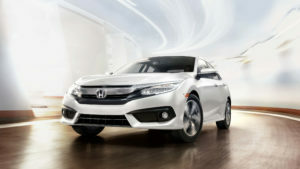 Canadians know that the Civic is a reliable, safe and performance-driven small car that keeps elevating its segment. People expect the Honda to innovate with the Civic, and that’s what’s happened with the all-new 2018 Civic Si. After taking a break last-model year the Honda Civic Si is back for 2018 with a vengeance. Originally introduced in 1984, the Sport Injected (Si) Civic is the highest sport level trim, and is available this year with both a Coupe and Sedan model. It is the most dynamic and capable Civic Si ever. Visit us today at Huntsville Honda to test-drive the new 2018 Civic Si and see sports performance for yourself. Go ahead and browse the rest of the large line-up of 2018 Civics online too if you’re not sure what you’re looking for, or talk to our amazing sales specialists. As one of the most reliable and safe vehicles on the road, investing in a second hand Honda Civic is another amazing option for your driving needs. To see additional specifications about the Honda Civic Si in Muskoka visit our Honda showroom. The all-new 2018 Honda Civic Si is engineered to be lighter and more rigid than previous models. Powered by Honda’s 1.5L 16-valve direct-injection turbocharged 4-cylinder engine, there is a definite kick under the hood with top outputs of 206-horsepower and 192 lb-ft of torque. 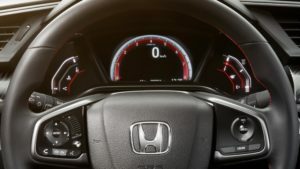 The Civic Si has a 6-speed manual transmission and also has a sport mode button to take your Civic Si to another level. Both the Coupe and Sedan models offer helical limited slip differential which drives the performance up even more. 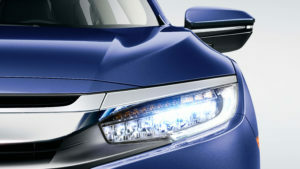 The Civic Si will also go further for less with a fuel efficiency of 8.4L/100km city and 6.2L/100km on both models. Both the 2018 Civic Si Sedan and Coupe are designed to drive. They feature rear-wing spoilers, centre exhaust finishers and eye-catching 18-inch aluminum alloy wheels. Great colours are available for both, including Aegean Blue Metallic and Rallye Red, which are sure to make you stand out from the pack. The Civic Si is a great drive too, featuring Agile Handling Assist (AHA), Straight Driving Assist and Variable Ratio Electric Power-Assisted Rack-and-Pinion Steering. All this, combined with the two driving modes so you can customize your drive to you. The 2018 Civic Si is ready to show-off. The 2018 Civic Si is packed with technology and interior features that make driving a blast. The 7-inch colour centre display allows you to control everything with ease. 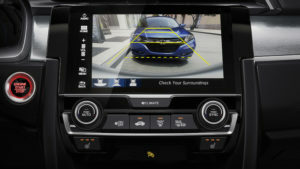 Bluetooth compatibility, Apple CarPlay, Android Auto, SMS text and email function, and Honda satellite-linked navigation come standard, making your car extremely connected. Taking it further, enjoy the standard wireless charging and wi-fi tethering. You’ll always be comfortable with one-touch turn signals, dual-zone automatic climate control and the acoustic windshield. The 2018 Honda Civic Si Coupe and Sedan have been bringing in the awards this year, which just shows Honda’s commitment to safety in their vehicles. Both have been awarded 5-star overall safety ratings by NHTSA. The next-generation Advanced Compatibility Engineering (ACE) body structure starts safety from the core of the 2018 Civic Si. Going above and beyond, Vehicle Stability Assist (VSA), Dual-stage multiple-threshold front airbags, Hill Start Assist, multi-angle rear-view camera and Honda LaneWatch blind spot display keep you and your passengers safe. If you’re looking for Honda Civic Si parts and accessories then look no further than the Parts Department at Jason Armstrong’s’ Huntsville Honda in Muskoka, ON. We carry a variety of genuine OEM parts so you can find great Civic Si parts for your vehicle in Muskoka, Huntsville, Bracebridge, Burks Falls, Parry Sound, Port Carling, Orillia, North Bay and Haliburton.